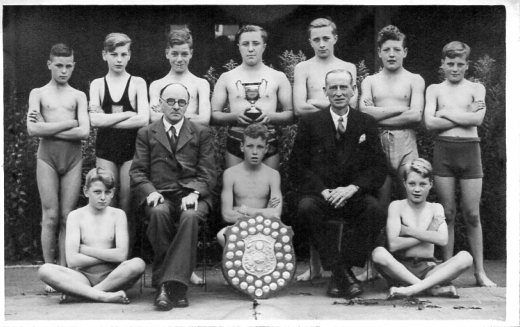 I thought this photo of successful competitors of High Oakham boys at the 1945 Mansfield Schools swimming Gala, would jog your memory of names and faces. If my memory serves me correctly, the names from L to R Back row are……. David Burton, Roy Cornwell, Frank Renshaw, Ken Riley, —Watts, Alan Gray, Lionel Clayton. Keith Pearson, W.B.White, Douglas Hollingsworth, G.H.F.Payling, Harold White. Douglas Hollingsworth!! Stalwart of Sherwood Swimming Club in the 40s and 50s. His dad and Pop Harwood were the elders of the Club. My word! This picture takes me back, In particular seeing Mr White and Mr (Pop) Paling. These lads were the year in front of me at High Oakham School. But I did join them the year after when I had proved myself at swimming. I recall being chosen in a of team four to represent the school in the county championships at Walsall Baths. We came third, so I guess it wasn’t too bad. I recall that Alan Gray, and Don Parsons, and another boy whose name escapes me, were in the team. I remember just about everyone in the picture, it is amazing how anyone who was outstanding at one sport, stood out in other sports. Thank you Roy for showing the picture, it has brought about so many memories.